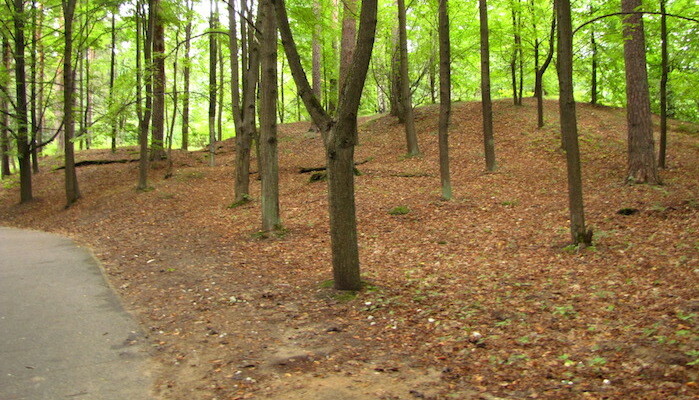 Mežaparks, a neighborhood along the Ķīšezers lake in the northeast of Riga, was established as a military camp, and named to signify “The Forest of Kings.” The wooded area remained primarily farmland until it became a popular destination for summer villas in the 19th and 20th centuries. Today, Mežaparks is one of the finest neighborhoods in Riga, with a number of gorgeous paths winding through forested parkland. A loop around the park grounds is about 6 km (4 miles), or create your own route among the 7 miles of paths. If coming from the center of Riga, runners can take Tram 11 to get to Mežaparks. or run the bike path along Ķīšezera iela and then the tree-lined pathway of Kokneses prospekts, passing by some fantastic wooden homes. Adds and can add an extra 6 km (4 miles), each way.